The euro vs dollar attempted to rally once again yesterday and as on previous occasions where this has occurred, ran into the formidable, technical barrier which is the 40 day moving average, and which brought a halt to this move. In this morning’s London trading session this effect has once again come into play with the 40 day average preventing any attempt to rise and keeping the euro vs dollar confined to its narrow trading channel where prices have been oscillating for the past few weeks. From a fundamental perspective this morning’s high of USD1.2910 was immediately reversed on the release of the German ZEW data which came in at a horrible -4.3 against a forecast of 10.7, a figure not seen since the bad days of March 2009 and moving the index back into negative territory for the first time since then. In addition the ZEW economic sentiment figure for the eurozone was also very bad at 4.4 against a forecast of 14.9, just managing to stay in positive territory but presenting a similar picture of potential problems for the economy. Should this negative sentiment for europe ripple into the US trading session then we can expect the euro vs dollar to sink further, possibly to reverse yesterday’s positive gains and test support at the 9 and 14 day moving averages which are now immediately below. 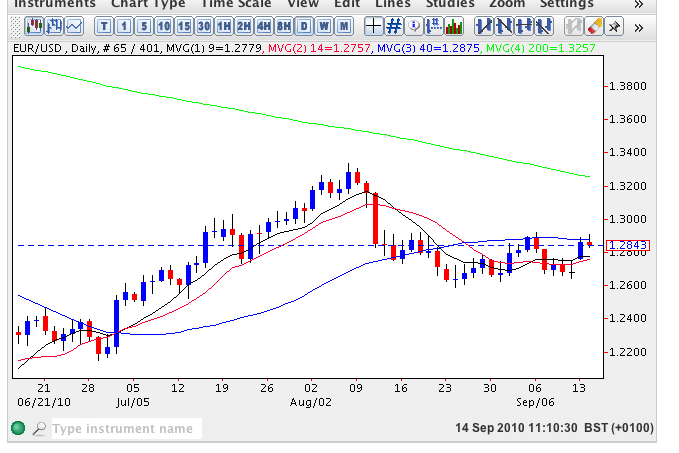 In the short term we need to a break out from this current range and to the downside this will be signalled by a break and hold below USD1.2587 whilst to the upside any move beyond USD1.2920 could see a re-test of USD1.30 and beyond, although a move to the downside looks the more likely with a subsequent re-establishment of the longer term bearish trend.